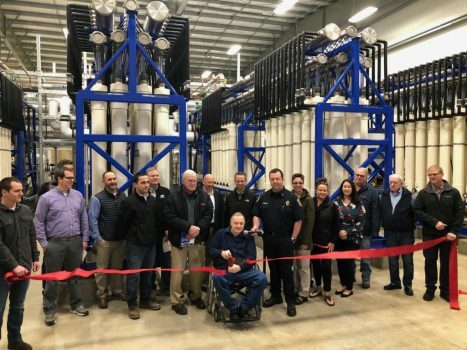 Lebanon, OR – The new water treatment plant facility had a ribbon cutting ceremony on Thursday, March 15, 2019 and was followed by a tour of the newly constructed facility. The City of Lebanon’s Mayor took the stage and highlighted the history and growth of the community before slicing the red ribbon with heavy duty scissors. The previous water treatment plant was constructed in the 1940s and has lived its useful life. In the 1940’s, the community had a population below 4,000; fast forward to 2019 and the population is 17,000 residents. This facility will be able to support its current population and future growth as well. Another major milestone for the City was to have its own source of water via the new intake structure; and for the first time in Lebanon’s history they no longer rely on another community to provide their water. The new water treatment plant replaces the City of Lebanon’s outdated facility, which was in need of replacement. The new facility has capacity of 4.5 million gallons per day (mgd), with the capability to be upgraded to 8mgd, and includes a raw water intake facility on the S. Santiam River. Other components of the project included a raw water pumping station a raw water electrical facility, and two 42” canal under-crossings. Slayden completed pre-construction and construction services on the water treatment plant, which included an extensive value engineering process with the owner and Carollo Engineers to ensure the project stayed within the City’s budget. This project would not have been possible without the Lebanon City Council, City Manager, and hardworking City staff. It took a team of collaborative organizations to complete this project and they include: Carollo Engineers, Slayden Constructors, Udell Engineering & Land Surverying, Erwin Consulting Engineering, Crawford & Associates, ESA, h2O Innovation, Team Electric, R2 Resource Consultants, West Consultants Inc., Foundation Engineering Inc., Shur Architects, Haley Construction, Inland Crane, Green & White, The Automation Group, and Eurofins.